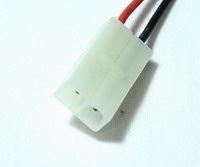 Micro JST male: connector with wire leads. This is the Battery end - it is typically found on small 1S LiPOs. Also known as JST micro 1.25mm. The spacing between the connective pins is 1.25mm. Connector Locks : hold male & female servo/battery connectors together. Fit Futaba, JR, HiTEC, SPEkTRUM, AIRTRONICS. JR-SPEkTRUM-HiTEC-AIRTR. Z Female Connector with 3-color (orange, red, brown) 12" wire leads. You can plug your battery packs & servos INTO this connector. Wire is 22-gauge. KYOSHO Male Connector Housing & 2 metal Pins. $ 1.00 each set. Choose quantity - discounts on per-unit price ! 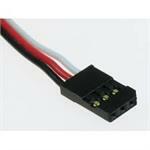 JST Red 2-pin female connector w/ 6" wire leads for Motor/ charger/BEC circuit. This larger end is referred to as the "female" or "charge" end. Also known as the GWS-BEC female connector. JST-GWS male red 2-pin connector with 6" wire leads. Goes on battery pack. Use on electric flight batteries and TX batteries. 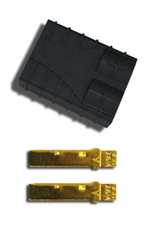 This connector is also known as GWS-BEC connector. This smaller end is referred to as the "Male" or "battery" end. KYOSHO male connector with Wire Leads. Choose quantity desired. KYOSHO male connector with wire leads. Commonly the battery end. KYOSHO is also known as mini-Tamiya. TAMIYA battery connector w/ 6" heavy-guage wire leads (black & red). This end typically goes on a battery pack, and is referred to as the "female" end. Traxxas brand high-current motor/charger Connector housing with 2 Gold-plate pins (can be soldered onto). 2mm Bullet Connectors : Gold Plated, pkg of 1 Male & 1 Female conn.
2mm Bullet Connectors. 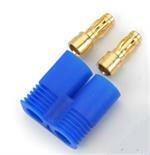 Pkg of 1 Male conn. & 1 Female conn. Gold Plated. Ideal for R/C hobby applications. You can solder Wires into one end of each connector. The KYOSHO connector set. Consists of 1 Kyosho battery end & 1 Kyosho motor end (wtih wire leads on each). Choose set quantity desired. JST female (motor-charger end) kit - 5 housings & 10 pins. $ 2.75 per kit. Choose quantity - from 5 housings & 10 pins, up to 500 housings & 1000 pins ! Set of 2 Red & 2 Black Anderson PowerPole connector housings + 4 metal pins. For R/C applications or any other High-Amp usage. A.K.A "Sermos" connectors. Red micro polarized connector set: Set = 2 pcs. 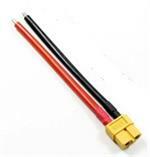 These are deans style Red-color 2-pin connectors, with heat-resistant housings. Pieces are identical to each other. For small-scale electric R/C applications.